Revue Independante et Internationale d'Informations et de Bibliographie / Concernant les Faits psychiques et telepathiques, l'Occultisme, la Tbeosophie, le Spiritisme, les Religions et les Philosophies anciennes, la Magie et la Sorcellerie, les Traditions orientales et occidentales, le Celtisme, l'Hermetisme en general, l'Alchimie, l'Astrologie, la Chiromancie, la Graphologie, la Physiognomonie et la Phrenologie, l'Hypnotisme et la Suggestion, le Magnetisme, la Medecine hermetique et spagyrique, la Franc-Maconnerie, et les Societes secrètes, etc. 1/1-2, May-June, 1903-1/12, April-May, 1904. 12-18 pp., 3 francs a year. The subtitle gives a good indication of what the general term occult encompassed at the beginning of the twentieth century. The journal combined articles on the books its contributors considered fundamental in each area with regular extensive reviews of current works and journals on those subjects. Contributions by F.-Ch. 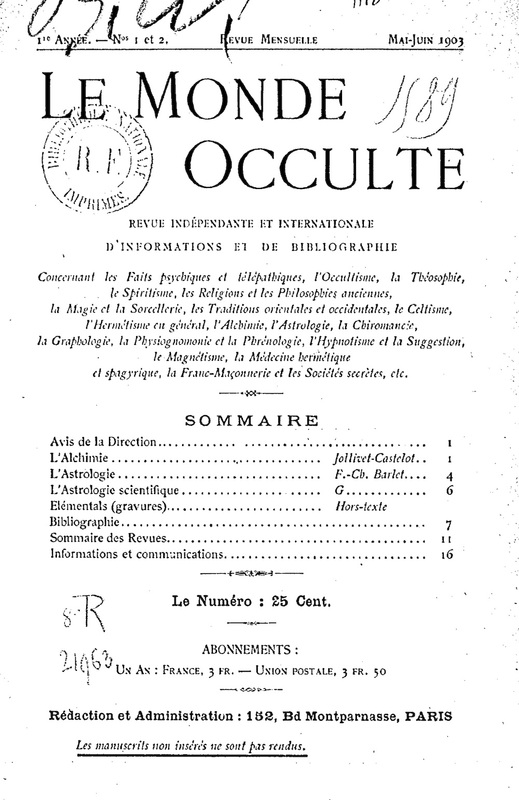 Barlet, Jollivet-Castelot, and other, lesser, lights of the French occult revival of the 1890s and the first years of the new century. Regular bibliographical notes and extensive lists of books offered and sought. BNF.